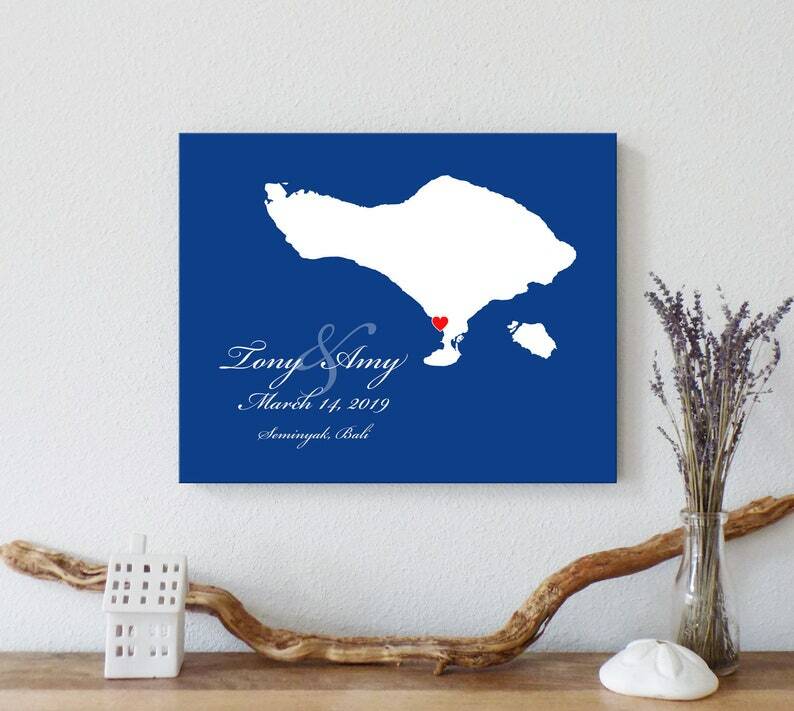 Silhouette of Bali on a bold color background, personalized with your information and a heart marking a special location. This artwork makes a beautiful wedding, anniversary, or engagement gift. It can also be used as a guest book alternative, allowing guests to sign the print instead of a book, and afterwards, you can hang it in your home as a keepsake reminder of your special day. Framed Prints are paper prints professionally framed inside a modern 1” wood frame, they arrive with hanging hardware, ready to be displayed. Frames are available in Black or White. Canvas Prints are printed on high-quality, heavyweight canvas to give them a real artistic feel. Canvas Prints are stretched onto a sturdy wood frame so they arrive ready to hang.